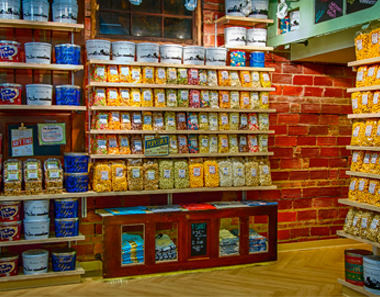 Campbell’s Sweets Factory was birthed from a commitment to a dream: inspired by his father, Amos “Jupie” Campbell who owned several Karamelkorn® franchise stores, Jeff Campbell wanted to bring the wonder of a hand-made candy store to his hometown of Cleveland, OH. These dreams were cut-short with the drought of retail in the area (with his flag-ship store “The Proper Popper” feeling the weight of the decline and eventual closing of Randall Park Mall). Suddenly this dream of a candy-shop was flipped on it’s head and seemed like it couldn’t be done; but Jeff was determined to see this dream realized in Cleveland. 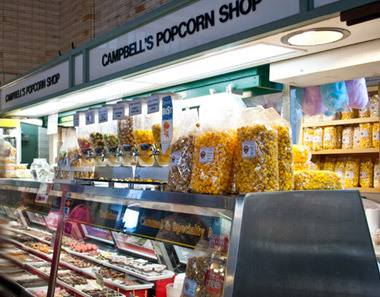 In 2004, Campbell’s Popcorn Shop was opened in Cleveland’s historic West Side Market, and eventually was re-branded as “Campbell’s Sweets Factory”. With a lot of hard work, things slowly began to pick up momentum, and just a decade later, Campbell’s continues to grow as our delicious popcorn is now sold in not only our own (3) retail locations, but can also be found in many grocers and retail shops in the Cleveland area: several Giant Eagle stores, the Hard Rock “Rocksino” in Northfield, local Heinen’s locations, BA Sweetie’s, CLE Hopkins Airport (in their Hudson News stores), and many more locations near you! 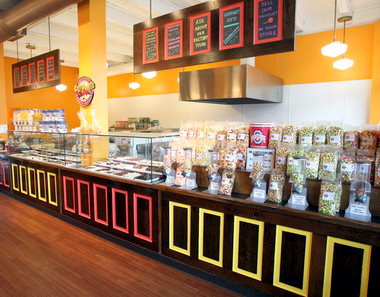 In the near future, we hope to explore the opportunity to open a fun, interactive (but also efficient) production center so we can better-supply the Cleveland area with the popcorn it loves! 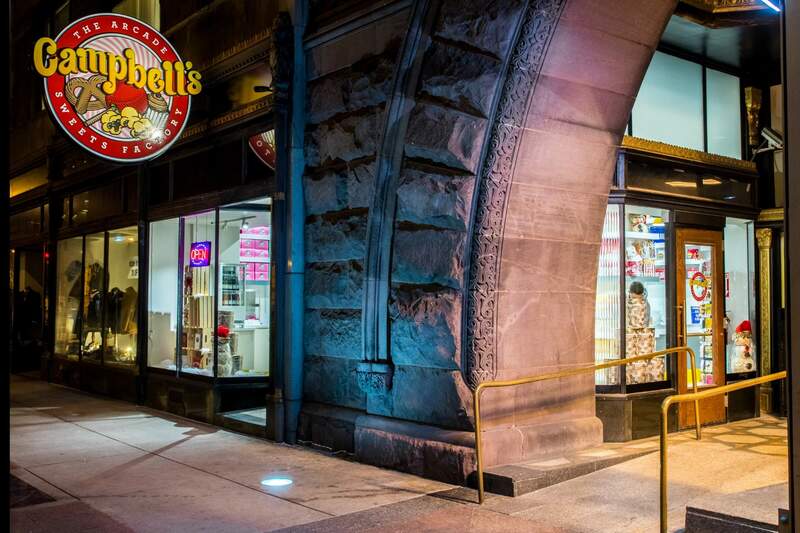 This growth has spawned from a central core-value we have at Campbell’s in our commitment to producing quality, hand-made goods; a commitment that runs as deep as our commitment to the home-town city we know and love of Cleveland, Ohio. Never once have we deterred from this promise of using quality ingredients like real butter, pure-cane sugars, or our signature massive-flaked kernels of Ohio Grown, NON-GMO popcorn seed. Our mission is simple: Keep Cleveland Sweet. This idea has inspired us, driven us, propelled us forward, and kept us focused on the dream to see the joy and fun of hand-made, gourmet goods produced & sold in fun, interactive shops in our hometown. We’ll continue to develop this idea for as long as there’s plump popcorn to pop, crisp pretzels to hand-dip in chocolate, and fresh-baked cupcakes to be enjoyed. We hold it as our personal goal and responsibility to stay devoted to that idea of Keeping Cleveland Sweet! 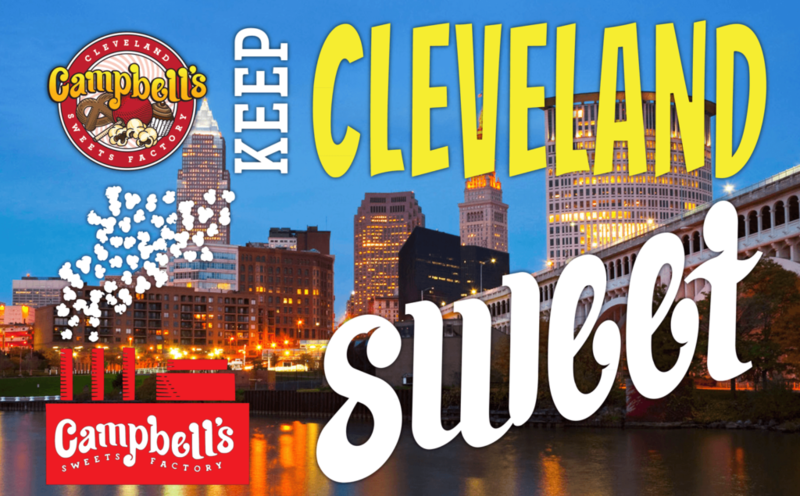 You can #KeepClevelandSweet from home! At Campbell’s, we have so much fun hand-making gourmet products that it’s hard to keep our “secrets” to ourselves! In 2015, Jeff Campbell teamed up with local personality Jami Kinton to produce some fun #KeepClevelandSweet videos, where they share some great tips you can use for your own home-popping fun! We’re happy to share our love for hand-making delicious popcorn at home, so enjoy these videos as you pop-from-home with your friends and family! Check out our other #KeepClevelandSweet videos below for each helpful home-popping session!